I can not stand how cute these babies are! OH MY! I have named the little yellow chick lady marmalade - I was making some lemon ginger marmalade yesterday and it seems to fit her. Any suggestions for the other two? I have wanted laying hens for awhile but I live in town and never thought it was possible until I met a neighbor who had chickens and ducks. Right downtown! I would go visit those chickens regularly and sometimes find an egg or two. So even though I don't have a coop - yet- I decided to get some chicks and just dive right in. I chose three breeds. Three because my friend said four would be too many? You have to set your limit somewhere I guess. 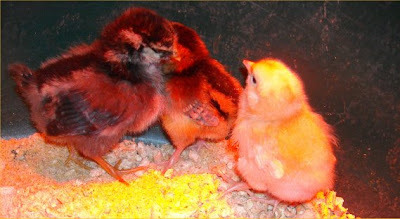 The little yellow baby, marmalade, is a buff orpington. She should look like this when she gets older. they are described as sweet and curious and recommended for first time chicken moms. The second chick is a speckled Sussex and this is where my carefully chosen list of chickens I should buy went right out the window. 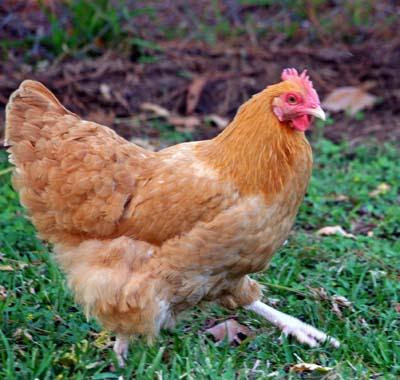 See, I did some research before I went to the feed store so I would get easy chickens suitable for someone who only knows that chickens lay eggs and are fun to watch. But then I saw the big bin of chicks with a glossy photo of a beautiful spotted hen and, well, my list went right back in my pocket. Now that I was just randomly picking chicks it got a lot harder. 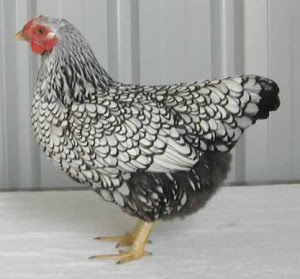 I was deciding between one of those punk rock looking polish breeds with the plumes on their heads or the lovely silver laced wyandottes like saw at last years county fair. Just look at those black tipped feathers! This hen is ready for cocktails and a night of salsa dancing! So glamorous! I am still not entirely sure which chick I ended up with but, I asked for ms. silver lace. They were in the same bin peeping and running around like crazy so I hope we caught the right chick. If not, a polish punk chicken will fit in perfectly around here! UP the Punx! 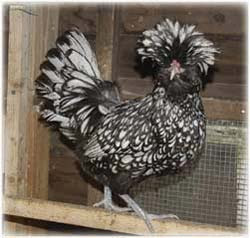 After doing a quick search the web says Wyandottes tend to be dominant birds. This is my largest chick and she is definitely in charge of the other two. All of my lady birds - please let them all be lady birds!- should lay brown eggs. My dog, scout, has been very eager to eat meet them. I will really have to keep an eye on any predators like neighborhood cats, dogs, and raccoons. Hawks should not be a problem in the city but some bird fencing should prevent a hawk attack. So I hope you will all join me as my blog shifts focus a bit from exclusively baking to my experiments in urban farming! 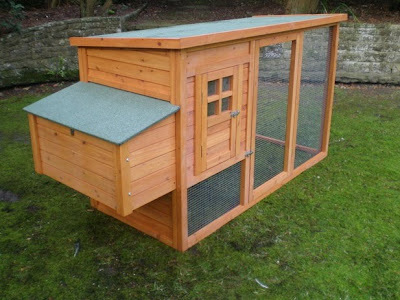 Now to get some "volunteers" to help me build a coop! This one is lovely don't you think? I have wanted my own egg laying hens for years! Fresh eggs for baking, and eating! I could only imagine the color my creams would be :) However, i am fearful we have a lot of coyotes and foxes in my area. Bravo. Please post some eggs! No recommendations for names, although the red chicks look a spicy name might fit them.